Electric towel warmers are an easy way to add luxury and comfort to your home. Whether you need to relax after a stressful day at work or you're waking-up to a brisk winter morning - who wouldn't want the comfort that an electric towel warmer can bring? The most common type, electric towel warmers come in a wide variety of styles and sizes. Before getting hooked on a specific design, you should first consider how you plan to connect the towel warmer to a power source. Electric towel warmers come in two different connection types, plug-in and hardwired. Making a decision will be easier after you consider: aesthetics, installation difficulty, and bathroom layout. 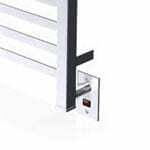 Plug-in towel warmers are the easiest to install, as they plug right into a wall outlet. If you have a GFCI (ground-fault circuit interrupter) outlet near the location where you hope to mount your towel warmer, this is an easy option for you. Although plug-in towel warmers tend to be slightly more expensive than their hardwired versions, this is offset by not needing an electrician for installation, making them a less expensive option overall. If you don't have a readily available outlet or you'd prefer a cleaner look without a visible cord, there are plenty of hardwired options available, as well. 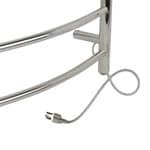 Hardwired towel warmers will require a bit more installation work, as an electrician will need to cut into your wall and connect the towel warmer directly to your home's electric wiring. For your safety, we recommend hiring a licensed electrician for this type of work. With this added effort, though, comes a lower upfront cost and a fully-integrated look you can't get with a cord and plug. Electric Towel Warmer Buying Guide - How to Pick the Perfect Electric Towel Warmer. Our heating, ventilation and cooling equipment how-to library can help you pick the perfect comfort solution for your home.